Our family got sick this week, and is on the mend. Poor Aaron has a cold and eye infection. Moreover, he has two teeth coming in, so the little guy has been miserable. We have spent the last few days bundled in warm clothes near the house’s one heater, wiping our noses, sipping fluids, and listening to Christmas music. Whenever I got sick as a child, my mom would fix me a steaming bowl of chicken noodle soup. Somehow it would make the day a little bit better. In that same spirit, I made a large pot of chicken soup today, hoping for its magical healing powers to work on our family. 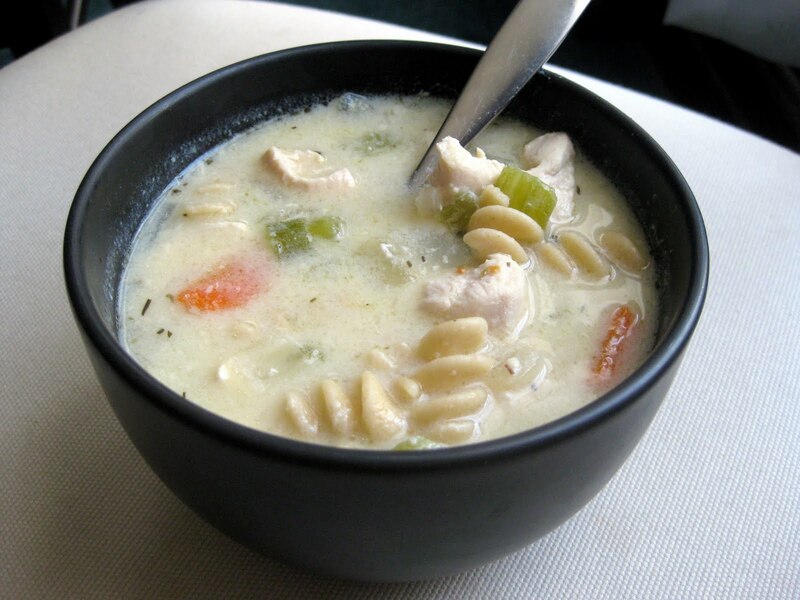 The soup is hearty and comforting, with large chunks of chicken, creamy broth, and a nice lemony thyme flavor. The eggs give a thick creaminess without the higher fat content that cream-based soups have. Heat 2 teaspoons of the oil in a large pot over medium-high heat. Season chicken with salt, add it to the pot, and cook, stirring a few times, until just cooked through, about 5 minutes. Transfer chicken to a dish and set aside. Add the remaining 2 teaspoons oil to the pot. Add onion, celery, carrot and thyme, and cook over medium-high heat, stirring until vegetables are tender, about 5 minutes. Add 5 cups of the broth and bring to a boil. Add pasta and let simmer until tender, about 8 minutes. Turn heat to low to keep soup hot but not boiling. Warm the remaining 1 cup of broth in a small saucepan until it is hot but not boiling. In a medium bowl, beat the eggs. Gradually whisk the lemon juice into the eggs. Then gradually add the hot broth to the egg-lemon mixture, whisking all the while. Add the mixture to the soup, stirring well until the soup is thickened. Do not let the soup come to a boil. Add cooked chicken to the soup. Season with salt and pepper. Makes 4 servings. I hope your family gets better! Poor Aaron! I love chicken soup too whenever I'm sick. It's like a delicious boost of energy. I love making a nice chicken noodle soup on a sick/rainy day. Though I've never quite thought about whisking in eggs to thicken it. Thanks so much for the tip! Can't wait to try it out. Though I've also discovered (maybe it's just me), just a tiny tiny pinch of cayenne pepper would add another fun layer to the soup. Just a thought!